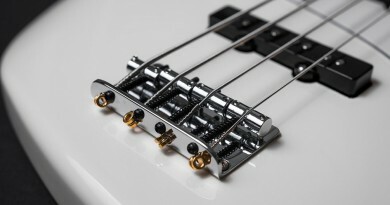 According to the documentation, the only difference between the original Dual Mode Octabvre and the new mkII version is the addition of the TIM switch that alters the way the TONE knob behaves. Therefore, you could consider this a double review also covering the original version. I will test and comment on the new TIM mode, of course, but if you factor that part out, you would essentially have the original version of this pedal. In terms of the score result, I’d say that the numbers would be quite similar, only taking a few notches out of the versatility and sound scores due to the missing TIM feature. The Octavbre mkII comes with 4 large knobs, a single 2-way toggle switch, two footswitches, two LEDs, two jack connectors and a power supply input. The first knob from the left is named VOLUME and basically sets the overall master output level. This is the knob you tweak to dial in unity gain once you have the octave tone and balance in place. Or you might use it to give it a small boost if you mainly kick in the octave effect for soloing. The MIX knob simply controls the balance between your dry tone and the octave below. The TONE knob changes the nature of the lower octave’s tone. That is why this pedal is also referred to as a ‘Dual Mode’ octave stompbox. 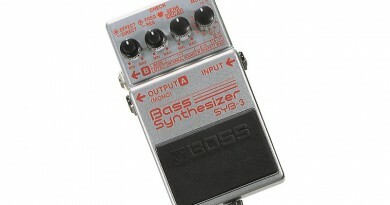 When turned fully counterclockwise, the pedal is designed to emulate the classic Boss OC-2 Octave tone. And when fully clockwise, the tonal ideal is the more gritty Mutron Octave tone. And in between these two settings, there is a whole world of various octave tones to discover and explore. The BYPASS footswitch is universal and as you would expect it engages/disengages the pedal. If it is engaged, and you play with a classic blend of your dry tone and the lower octave, the SUB footswitch allows you to kill the dry signal instantly, leaving you with the sub octave in isolation – and deep in the synthy sub-bass territory. The SUB VOL knob adjusts the lower octave when in isolation which is very neat as you would often need to adjust a bit compared to when you have a mix with the dry signal as well. The Octabvre gives you a very wide range of octave tones, which makes it very versatile in a fundamental way. Add to that the option of having a dedicated footswitch to go into synth mode. Octave pedals have these two basic – and very different – types of usage and being able to quickly switching from one to the other is brilliant. On most other octave pedals, you will have to adjust the mix balance manually to get the isolated lower octave, which translates into knob-fiddling rather than a quick stomp. Or as an alternative, many use two separate octavers – one for each purpose. So, does the TIM mode double the tonal experience? No, it doesn’t. But it certainly adds to it and I do love it, but I would still consider the original Octabvre without the TIM mode a great octave pedal. Tracking is always important when it comes to octave pedals, and I must say that my first impression is that this pedal tracks amazingly well. I heard very few glitches and it was able to go pretty deep and still the pedal delivered a very solid-sounding lower octave. The build quality is great. It is a very sturdy pedal and it’s quite heavy, too. I heard no significant noise, all cables connected smoothly and had a nice and firm feel – as did the knobs. Speaking of the knobs, it’s probably a matter of taste, but since the pedal is slightly above average in physical size, I do like the big bulky knobs with clear white markings. It just makes quick tweaks on the fly a little easier. And similarly, the LEDs have unique colors – the BYPASS is red and the SUB VOL is blue – which gives very nice visual feedback on the stage. 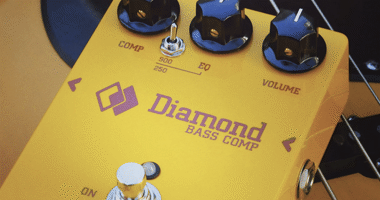 The power supply input is a standard 9V negative tip – the ‘standard’ Boss pedal type – which makes it very likely that you have an external power supply that will fit just perfectly. In terms of footprint, it’s a little big, but if you want a dual-footswitch design, it would probably not be practical in a standard Boss / MXR sized pedal. If you just want the 3Leaf Octabvre vibe in a smaller pedal, there is a MINI version with just one footswitch and 3 knobs. 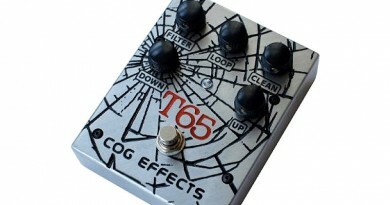 I have not tried it, but it is based on the TIM side of this pedal – only with a few slight adjustments to the TONE control. Needless to say that the geek here would like to get that version on the test bench as well at some point. 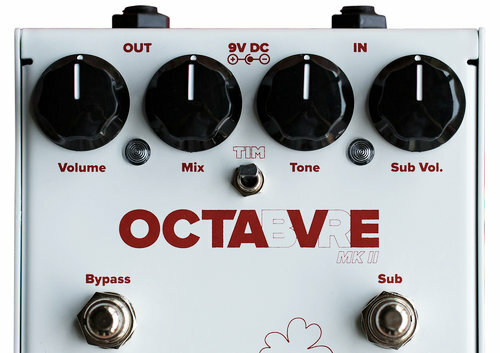 Today (2016), a new Octavbre mkII pedal is a $259 investment, which makes it a fairly expensive octaver. Having said that, this section is not really about expensive/cheap or the actual price as such. It is all about if the price in question is justified – if there is value for money or not. 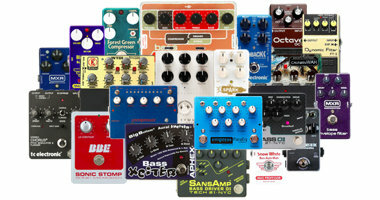 And as I have mentioned a few times, the way that I see it even the most expensive pedals could represent tons of value for money, whereas even the cheapest of pedals might not represent even a shred of value. 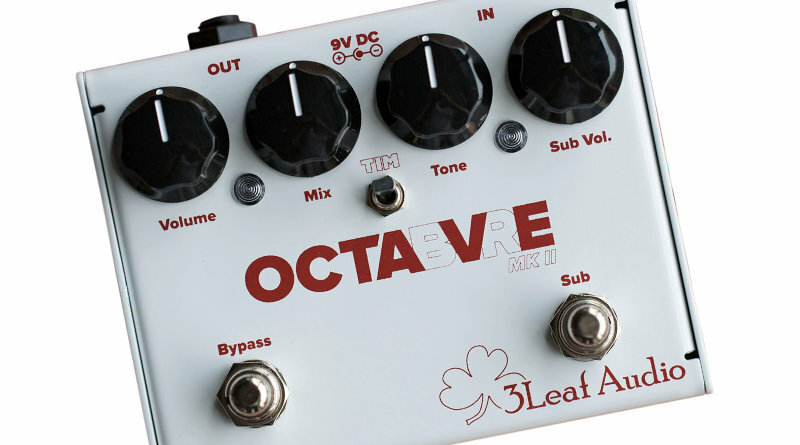 In this particular case, I have no doubt that this is one of the best octave pedals I have put my feet on so far, and therefore I will claim that there is great value for money here even considering the price tag. 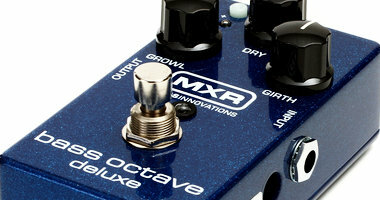 The Octabvre mkII is one of the best octave pedals I have com across this far. Fundamentally, it sounds great and tracks really well. The additional SUB VOL footswitch that lets you switch quickly between standard octave effect and synth tone is great. The TIM mode adds a lot of new tonal options to the mkII version, but even without it, it is a great pedal. The price is a little steep, but once you consider the ‘return on investment’, I think the price tag is justified.